Launched in October, Mercedes me is now open on the first Saturday of every month from 8am - 2pm, serving up their delicious menu from St. ALi. Australia's first Mercedes me Store, this is collaboration between Mercedes-Benz and St Ali and is a place for coffee lovers, car enthusiasts, creatives and collaborators. On the day of our visit we were fortunate enough to admire their latest showcase - an amazing 300 SL Gullwing which was in absolutely immaculate condition. We loved indulging in their delicious lunch offerings. Think beautiful Pasta puttanesca and a perfectly cooked pan fried snapper served along with baked tomato, raw and grilled new season asparagus garnished with fresh basil. 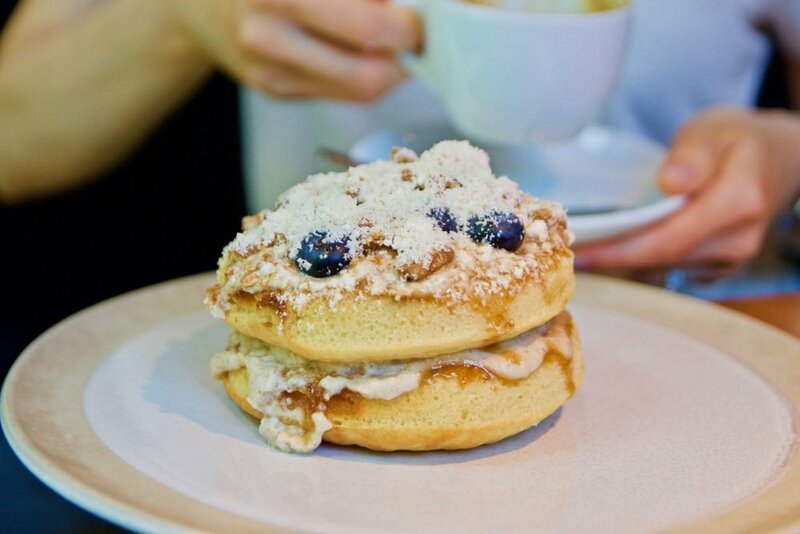 For sweet tooths (or for something sweet to share after your lunch), we highly recommend the salted caramel hotcakes. We loved the fluffy stack of milk hot cakes topped with spiced rum pineapple compote, caramelised coconut mousse, blueberries, coconut crumble and finished with lashings of salted caramel. It was sheer indulgence. The seventh Mercedes me location worldwide, Melbourne joins cities including Hamburg, Munich and Hong Kong. The space is truly Melbourne café culture meets Mercedes-Benz lifestyle. By day you can simply sit and enjoy great hospitality from St ALi, or engage with Mercedes-Benz like never before in a casual and relaxed environment. By night, the space runs special event and is the perfect backdrop for standout collaborations in art, food, fashion, sport, design and innovation.